Imagine wearing wooden shoes that weigh 8 kilos to straighten misaligned feet. It is perhaps hard to imagine that this boy, bullied at school because of his inability to run, or for that matter, walk properly would go on to become the pied piper of culinary arts and Michelin-starred chef called Vikas Khanna. Behind the success and public adulation of being the public figure called Vikas Khanna, lies a resilient, hard-working, disciplined man with a fire in his belly to pursue what his heart desires. Little surprise that his most successful restaurant is called Junoon – translated from Urdu it means obsession or a burning desire. I sat him down in a book store after hosting his book launch to talk more about him. 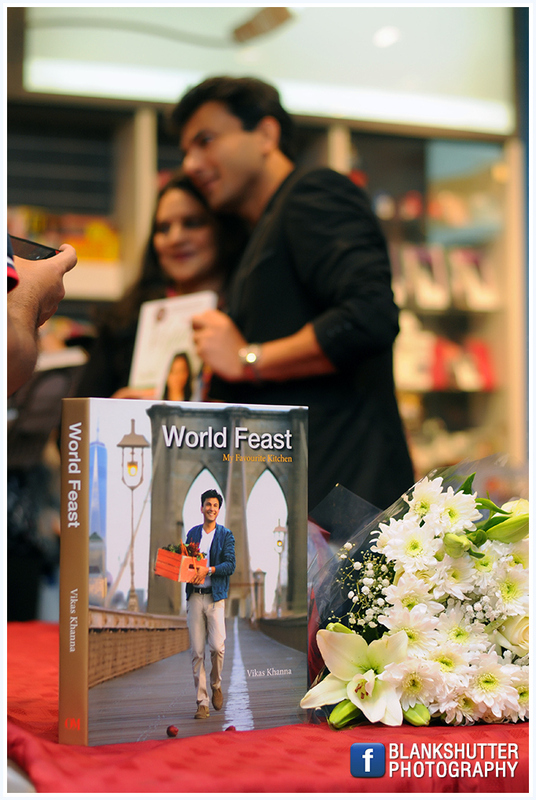 That was after he had signed my copy of World Flavours – My Favourite Kitchen. 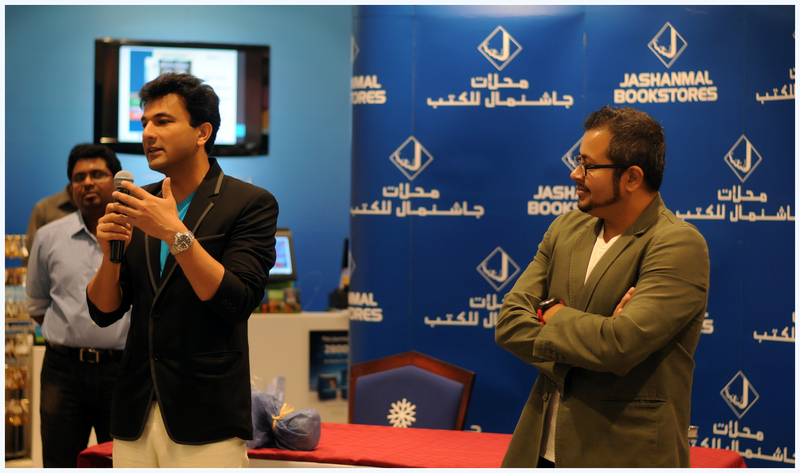 During the book launch, I grilled him in front of his fans and he took it all on his chin with his trademark ‘Punjabi’ humour. He is a man of his word. He loved the radio interview that my colleague and I conducted a couple of months back when he ‘booked’ us to host his book launch. When his team got in touch with us did we realise that Vikas means what he says. The story he tells everyone is about him starting his own catering business for small local parties. “Imagine opening up in an alley behind the house! Who would have come?” asks an excited Vikas. He was 17 then. Usually, boys that age are riding motorbikes to impress a local Rapunzel on the balcony or buying pimple cream hiding under a baseball cap. From there to the pristine training kitchens in Paris to owning his own in New York, Vikas is testimony to the adage ‘a burning desire’. He lives in New York, runs restaurants, takes time out for philanthropy, researches on food, writes books, is known in the White House, has fed numerous Hollywood stars and cooked for various charities – Vikas is indeed living the American dream. But more importantly, he stands for the courage to dream. Dream – what you want to do – then set out to get that dream to reality. For a celebrity like him has perhaps given more interviews than Gordon Ramsey has used expletives. He is always prepared with an answer. He is a chef extraordinaire – he can have the toughest of audiences eat out of his hand! With his wit, his humour that still stains Punjabi like turmeric on finger nails, his faulty English which he mercilessly hacks at, Vikas can regale you for hours on end with his stories. In this interview, I wanted to talk to the man behind all this; to get a glimpse of that Vikas, who Khanna protects fiercely. After 25 years of being in the kitchen, Vikas is still as nervous as his first time, when he enters the kitchen. “The anxiety of a dish to taste the same each time gnaws at my heart. There is something spiritual about being in a kitchen and preparing food,” he states. Deep inside, Vikas is loyal to taste and food and it is this very quality of his that makes him a star chef! You can tell my happiness! Through all that Vikas Khanna says and does, one thing that shines through is his love for family. Any display of familial love can get this “hottest man alive” all misty-eyed. While recuperating from a back problem in NYC, his team asked him if he wanted anything comforting and he asked for his mum’s ‘methi-aloo’ or potatoes made with fenugreek. “I could kill for that dish any day”, coos the chef. Vikas believed that that dish would heal him up completely. That dish means the life to him! 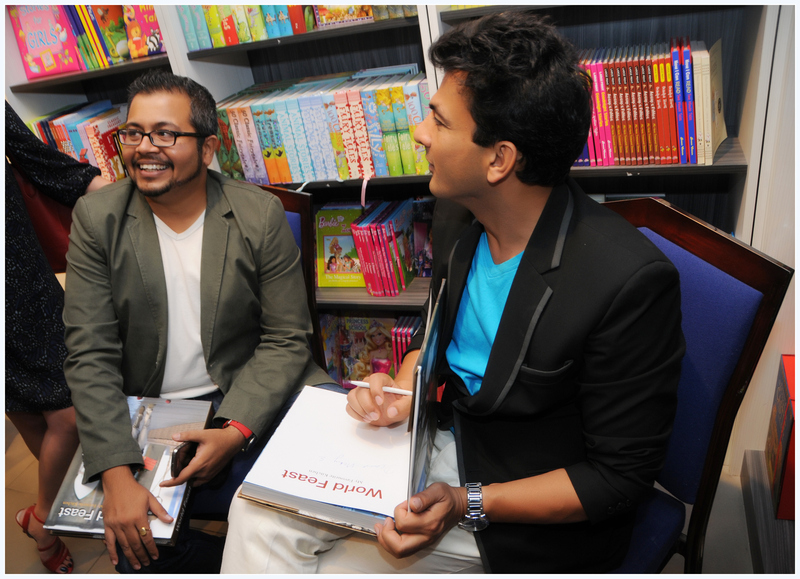 If Vikas Khanna could go back in time and meet Vikas Khanna, age 17, what would be the one thing that he would tell him? Vikas’s eyes wrinkled up in a smile and said, “You were the foundation.” As a teenager, he was not worldly-wise. He didn’t calculate risks! He just did what he wanted. Had he sat down to calculate risks, Vikas wouldn’t have been what he is now and he is thankful to that lanky ‘duffer’ teenager. 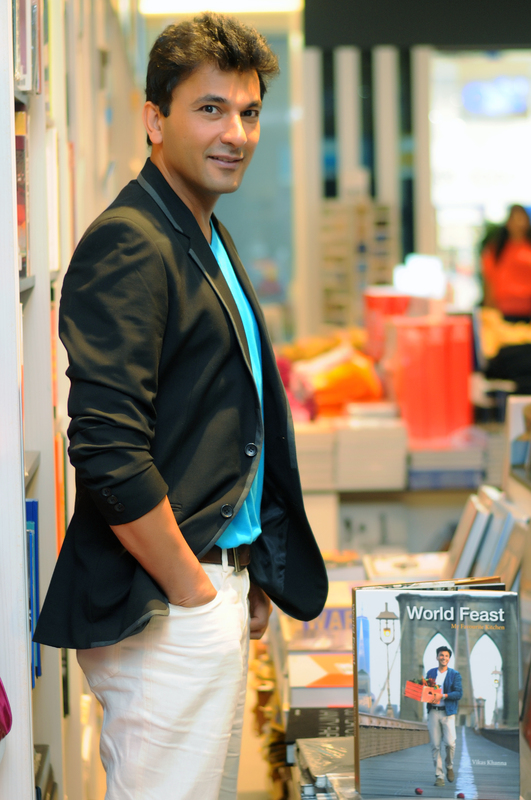 The glossy chef overtakes once in a while but Khanna was very comfortable talking about various things of his life. He mentioned that he picked up culinary terminology like “a zucchini should be tender but firm” and breaks into a syrupy smile. When asked on the kind of task-master he is in the kitchen – tender and firm or hard and cold – Vikas says, “Oh, you will not believe it but I am very tender with my team.” He has a multi-cultural team in his kitchen who he treats with love and respect. “But I cut-in different ways.” He adds naughtily. When it comes to deadlines, this smiling chef can sure add in some heat! A cook book is a cook book is a cook book. In Chef Vikas Khanna’s case, every cook book is a new story that he is waiting to tell all his fans and followers and anybody who cares to listen. Be it the food that grows and is consumed in the Himalayas by mendicants and mountain-dwellers to pan-India recipes that is made during festivities – Vikas picks out a story to tell. No wonder that this kind soul has dedicated the first chapter of his next project called UTSAV, with an invitation price of INR 8,00,000 ie $12,000/-, to transgenders in India. “Nobody cares about that section of society yet no celebration is complete without a song-dance and blessing from them,” narrates Vikas. Food is a ceremony, food is culture and that story must be retold. Imagine the frustration of a child unable to run! Nobody cared about misaligned feet. Like many other problems, this too added to the list of taboo and was kept in within the family. It was not possible to talk about it openly in society. He was called ‘skeleton’ by all his school mates. He only had his parents as his comfort blanket. Vikas braved a very tough and unimaginable childhood. He told himself that he was meant to be something else that the others will never be. Junoon (or burning persevering idea) at that age? Perhaps. When he saw artful gourmet food for the first time, the teen-aged Vikas was moved to tears, “Main inna sona khana aaj tak ni vekhya” (I haven’t ever seen such beautiful food). It is that same man, who now is whipping out works of art that people consume daily. How does he feel? Vikas swallows, puts back his smile and wishes he could see that same 17 year old walk in to his restaurant to see what he is doing now. He’d be proud. Funny that this successful master-chef was once called a jinx – anything that he touched, closed down. End 2006, Khanna was packing up to go back. Restaurants like Purnima, Tandoor Palace, Spice Route of India had all closed down and he didn’t know what to do. Khanna decided to go to Tibet and live there for some time. He is totally taken by the simplicity and spirituality of His Holiness The Dalai Lama so much so that he is writing a book on him! Khanna understood that to be a good chef, he must connect with the root. Otherwise, one is as good as a burger in a fast-food joint. Nobody remembers the taste after one has gobbled it down. 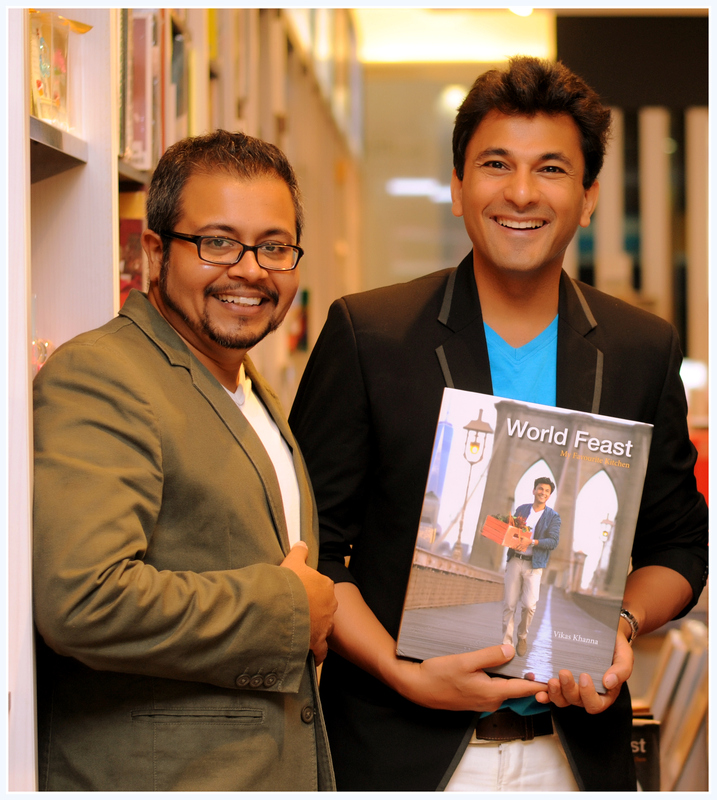 Vikas Khanna speaks about food like a maestro speaks about music and you can clearly see the common grounds. The only book that Vikas has read from cover to cover is Jonathan Livingston Seagull by Richard Bach. His brother found the novel in garbage. Vikas read the book and imbibed learnings about life and passion and flight. Training hard makes all the difference. His life is no different than that seagull that was bored of squabbling for daily food and wanted to do something entirely different. While most chefs dream of cooking for royalty and Hollywood stars, Vikas opened his doors for charity through food – Cooking For Life is an initiative that aids various foundations by raising money through food. He gets the food and the chefs and money is raised from various fundraisers right from Amar Jyoti to UNICEF. “Write me an award like this!” Vikas says, with his eyes flared up with passion. He is a Michelin-starred chef who has picked up numerous awards and will continue doing so. But what he finds most rewarding are the people stories that indicate to him that he is doing the right thing. Like a 90-year old Canadian-Indian who came to Junoon NYC to eat. Vikas was asked to attend to the table as the nonagenarian was all emotional after eating ‘aloo vadey’ or potato croquets. She called for the chef saying that it reminded her of her grand-mother’s cooking! Can there be anything more gratifying than this, asks Vikas. With the interview over, he gets up, gives me a warm hug and walks over to the crowd that welcomes him flash lights and endless selfie requests. 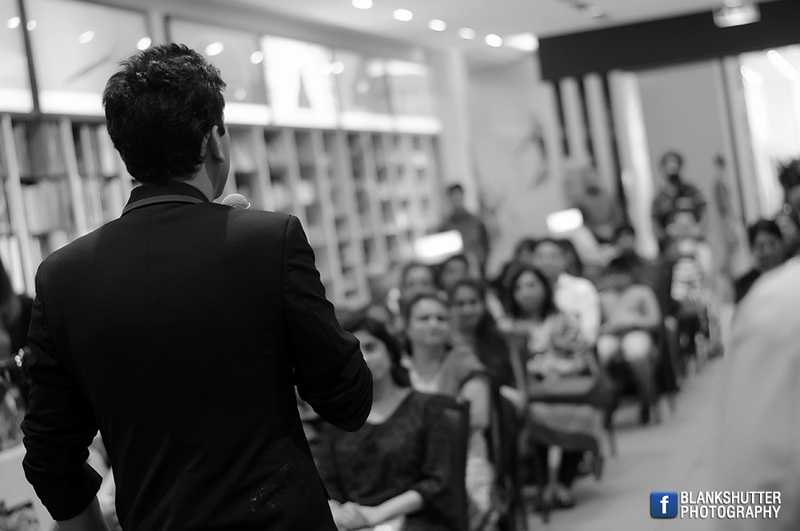 Chef Vikas Khanna will never let his audience down. ……………………………………………………………………… Dev J Haldar is the program director of South Asian radio station Suno1024, an academic and a food critic. That was truly awesome. What a gentleman chef vikas Khanna is. Hats off to him. Agree with you Sonali. Vikas is inspirational. Awesome Interview. Such an humble gentleman. He has inspired me and million others through his life story and being a person who loves his family and motherland immensely. Thank you for sharing this. Glad you liked it Bhumi. Thank you for stopping by my blog. I have been reading and checking Vikas’ videos online from quite sometime. Needless to say, I have never seen such a humble celebrity. He knows so much about food but when he talks it seems ‘he is the man next door’. Thank u Dev for sharing this .Looking forward for more interviews on him from you.